If you’re a dairy farmer, you’d certainly know that your income is directly proportional to the milk production at your farm. More the quantity and richer the quality of milk, the more profitable returns you get. However, it is not as easy as it sounds. 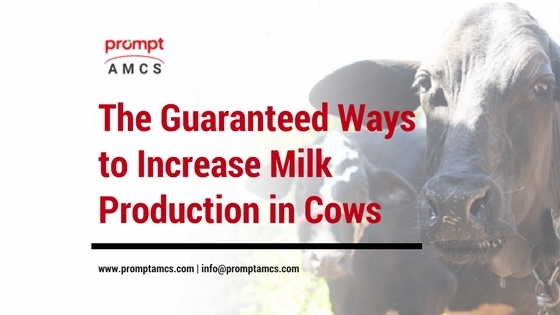 Milk production depends considerably on the type and breed of farm animals you foster. The quality of milk produced by your cattle is largely affected by what it eats, how it is fed, and the practices followed to nurture it. Perhaps, also how well you capitalize a milk software to manage your dairy animals just in case you’ve deployed it at your farm. A clean, hygienic environment is equally critical to high milk yield. Animals are susceptible to diseases if they live in a dirty, dilapidated environment unsuitable for their overall sustenance including health, breeding, calving, and lactation. Besides, the kind of dairy equipment you use for milking and the sanitation procedures you follow before and post milking need equal attention. All these factors play a similarly crucial role in determining the standard of milk output of your cattle. The milk industry solely depends on milk produced by these animals. Creating a proper shelter, selecting the right feed & feeding methods, uncontaminated water, clean & warm bedding, and regular veterinary services ensure increased milk yield, thus increased income. However, one important factor that directly affects the milk production of your animals is feed. The dairy animals require a balanced diet containing desirable amounts of nutrients for high milk production and good health. Also, these animals must be kept hydrated by supplying enough drinking water to them. A few tips on feeding, if well taken, can definitely assure a good health to the cows, hence, a boosted milk output. Napier, a fodder grass is used to feed the cattle as it provides significant energy for body upkeep, growth, calving, and milk production. Such fodder grasses comprise of a considerable amount of roughage which improves digestion and increases the level of fat in milk. You can also provide energy supplements like maize, wheat germ, and molasses to the animals. While feeding Napier grass to your cows, ensure they’re at least 3ft tall as they contain less water compared to the shorter ones. Otherwise, the cows might fall short of adequate nutrients which is undesirable. Protein is an essential component in a cow’s diet as it helps in building a strong body and produce quality milk with high fat content. It helps in breaking down the fibers into nutrients inside the rumen (the first stomach of a ruminant). The farmers must ensure that enough protein supplements are provided to the cows in the absence of forage. The deficiency of protein components leads to poor body growth, less milk with less fat, weight loss, and delayed maturity. Legumes and grasses like white clover, lucerne, and bean straw are good sources of protein while corn gluten meal, canola meal, malt sprouts, soybeans, etc. are excellent supplements to the natural protein. Mineral licks are equally essential for overall body functioning. Minerals like calcium, phosphorous, potassium, etc. play catalyzers to producing good milk and efficient organ functioning. The pregnant heifers, especially, must be well taken care of as they require more minerals than the non-pregnant cows. These minerals help in tissue and bone development of the new-born calf. As far as vitamins are considered, they are not produced naturally within a cow’s body. Essential vitamins like A, D, and E must be supplied explicitly through supplements in the diet to overcome the deficit. Providing ample supply of drinking water to your cows is equally important as what they eat, especially during the harsh summers when there’s scarcity of water. Keeping the cows hydrated by providing plenty of potable water sources helps them in the digestion of food, maintaining desired body temperature, and produce more milk. Dairy farming is a profitable business, provided it is regularly invested with adequate resources and capital. It requires cultivating a land to grow fodder and grasses for livestock, developing shelter for them, creating storage areas to preserve water and feed, and frequent veterinarian visits to your farm. The dairy farming requires considerable efforts, however, with the use of latest technology and dairy software, one can ensure copious milk produce and income. Happy milking!